Flamingos aren’t just for your lawn anymore! 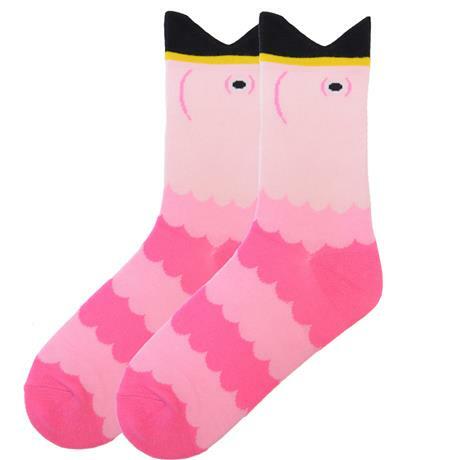 Are you tickled pink by a sassy new pair of fun socks? You’ll be giggling all day when you’re wearing our Wide Mouth Flamingo Socks. Wide Mouth Flamingo Socks feature fun pink feathering with a flamingotastic face and beak cuff. Bird enthusiasts and goofy sock lovers will enjoy receiving these hilarious socks for any occasion. Just be warned, they’ll probably squawk with laughter at such a randomly awesome gift. Wide Mouth Flamingo Socks are made from a 72% Acrylic, 25% Polyester, and 3% Spandex blend.